Welcome to September's edition of the Carers' Bulletin. September marks World Alzheimer's Month. 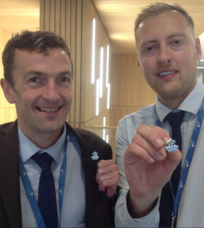 To raise awareness a number of Dementia Friends sessions have been held within the council. The movement is one step towards creating a climate of kindness and understanding, so that everyone affected by dementia feels part of, not apart from, society. September has also seen Young Carers in the news. BBC News in conjunction with Nottingham University produced research which suggests one in five children in England carry out some care for a sick and disabled family member. The report shows the importance of supporting and valuing the role Young Carers play in Coventry. If you've received an assessment of your needs or received services as a carer you may be asked to complete a survey of your experience. 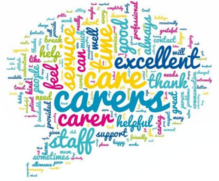 You may have received a Carers' Assessment or you may have had your needs assessed as part of a Joint Assessment alongside the person you care for. The survey is important to the council because it helps us understand what areas we need to improve both locally and on a national scale. Coventry City Council are hosting a workshop on Tuesday 30 October for small and medium sized businesses within Coventry and Warwickshire who are interested or already working towards the new 'Thrive at Workplace Wellbeing Award'. The focus of the session is on supporting carers effectively within the workplace. The session is free and will be held at Coventry Rugby Club on Tuesday 30 October from 9.30am to 12.30pm. There are a number of presenters, and the Carers Trust Heart of England will be available to provide additional information and advice. More details about the workshop and register. 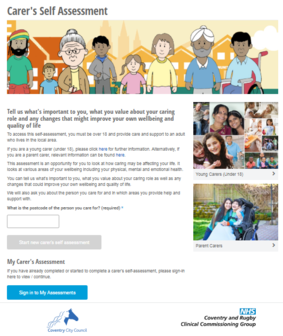 Did you know that you can now complete a Carers' self-assessment online? Anyone who takes on a caring role is entitled to an assessment of their needs, it may be that you've been caring for a long time, or it may be that your caring journey has only just started. It's a good way to take some time to think about your own needs, the impact caring may have had on your life, your strengths and aspirations. An assessment should help you understand more about the support you may need, your rights as a carer and where to find out more information and advice. The online assessment lets you complete it at your own pace, you can save it and revisit it when you've got the time. Once you've completed the assessment a worker from the Carers Trust Heart of England will contact you to talk through your assessment and the support you may need. The Carers online self-assessment is just one option for carers to have their needs assessed. If you'd prefer to speak to someone face to face you can request a Carers assessment by contacting Adult Social Care Direct on 024 7683 3003.